Catch Surf Beater Creature Surf Club X Original 54"
Creature edition Beater logo and skate-inspired placement on deck. - Signature Creature "Surf Club" graphic on bottom. - Available in Finless and Twin Fin models only. - EPIC SUMMER BEACH DAYS... THE BEATER IS ALL ABOUT FUN! 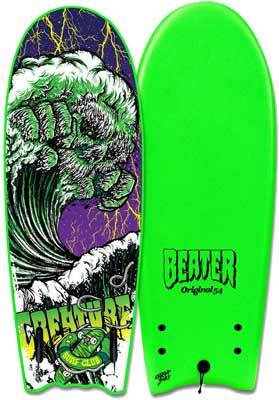 Created by the freaks at Catch Surf, the Beater Original is destined to take over the world. It is the original all-purpose, fully-customizable shred stick! Surf it with or without fins, bodyboard or skim it; do whatever the heck you want. The Beater can turn an average beach day into an epic tale of radness! Now shred. Features a strong, lightweight and water-resistant core with dual (x2) maple-ply wood stringers and high-density bottom to make it the stiffest most durable Beater ever made! Available in all-new colors. Single-Fin model comes with 4.5" raked fin and the twin-fin comes with 3.5" keel fins.